July 24, 2015 saw a bizarre, inevitably underreported musical phenomenon occur: WaterTower Music, Warner Bros.’ soundtrack arm, released the companion album to the new film Vacation, a record anchored by three unique versions of Lindsey Buckingham’s “Holiday Road,” the theme to 1983’s National Lampoon’s Vacation. Those versions—a remix of Buckingham’s original, a melancholy 2005 cover by Matt Pond PA, and a new end-credits rendition by the Zac Brown Band—were duly accompanied by a separate digital release from Warner’s catalog division, Rhino Records, collecting the original mix (its digital debut) and “Dancing Across the U.S.A.,” Buckingham’s other song from the classic film. With these releases, four separate versions of “Holiday Road” were simultaneously made available in the legal marketplace. A live take on Buckingham’s Live At The Bass Performance Hall (2008) brings this overall total to five—all of which made for diligent musical promotion for a negatively-reviewed (but entertaining enough) sequel to a film series whose last entry was in 1997. But my own reaction to this sudden abundance of “Holiday Road” was unexpected at best: in the days since discovering the various versions available for consumption, various iterations of the tune have passed through my eardrums about 30 to 40 times. Every subway ride, every down minute at work, the march to and from my apartment to the movie theater on opening night—all were turned into a madcap montage waiting to happen, anchored by Buckingham’s stupidly simple verses (27 words in total) and home-run hook of a chorus. I can’t remember getting this roped in by a song since Daft Punk’s “Get Lucky” debuted. 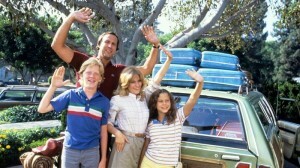 This of course begs some questions: what makes “Holiday Road” such a winner? Where did it come from, exactly, and why is it still sticking around? In hindsight, the logic behind this is twofold: commercial copies of the single on either side of the Atlantic don’t do a great job of telling the listener this is the big soon-to-be-hit from a big summer comedy. Chevy Chase’s “and you’re not” smirk isn’t present on the single sleeve, and references to the film are rote at best. Then there’s the matter of the all-important music video. 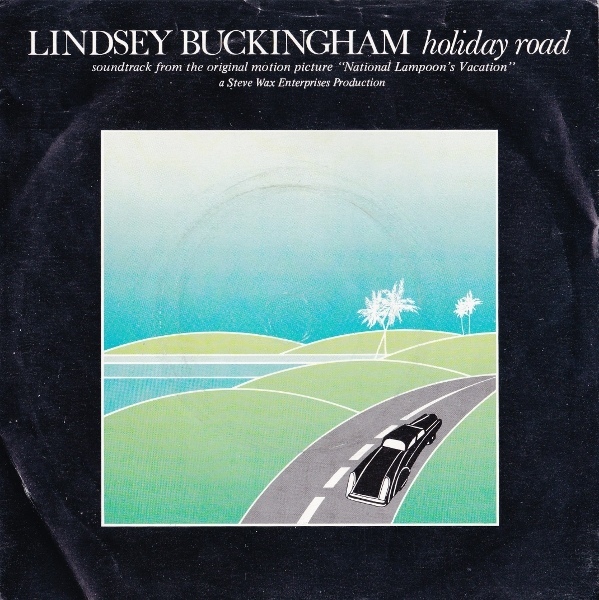 While many of the biggest film hits of the day were bolstered by videos interspersed with clips of the parent film at hand, Buckingham banked left on “Holiday Road,” crafting one of the strangest videos of the decade: a surreal send-up of corporate office culture that actively challenges the tune’s carefree nature. Even the song’s reputation as carefree anthem is at odds with Buckingham’s own recorded output at the time. The signature singer/guitarist for Fleetwood Mac had found his own straightforward rock/proto-punk songwriting and arranging style (exemplified on the bestselling Rumours  and its sprawling, underrated follow-up Tusk ) sidelined by the high-charting, Stevie Nicks-anchored soft-rock of 1982’s Mirage. Buckinham’s major contributions to that album, “Oh Diane” and “Can’t Go Back,” stiffed in America, a surprise after Buckingham took a solo hit, “Trouble,” off 1981’s solo debut Law and Order, to the Top 10. Buckingham was by now used to exerting much more control in the studio, playing nearly all the instruments on his own songs, and “Holiday Road” is emblematic of that trend. It’s definitely the work of a studio shut-in playing Frankenstein, anchored by an insistent drum machine/clap track and punctuated by strange, brilliant flourishes (Buckingham’s distinctive finger-picked guitar, the soaring harmonies in the chorus, the unsettling synthesized dog barks as the song fades out). The enigmatic appeal of “Holiday Road” is further compounded by Buckingham’s deafening silence surrounding the track. It fits neither the New Wave vibe of Law and Order or the pseudo-breakup album overtones of 1984’s follow-up Go Insane, though its vibe is in line with William Ruhlmann’s assessment of Go Insane for the All Music Guide: “a triumph of studio wizardry over songwriting craft.” And Buckingham has never really talked about it in interviews, its exact origins lost to time. Even fans don’t have much to say about it, outside of a brief but effective post on Popdose or another blog post on its difficult availability. Indeed, the song’s barely-two-minute running time suggests Buckingham and co-producer Richard Dashut tossing off a wacky little pop nugget and giving it to Warner Bros. (his label and the distributor of Vacation) as a goodwill gesture of vertical integration. So, then, what is it that makes “Holiday Road” such a junk food masterpiece? 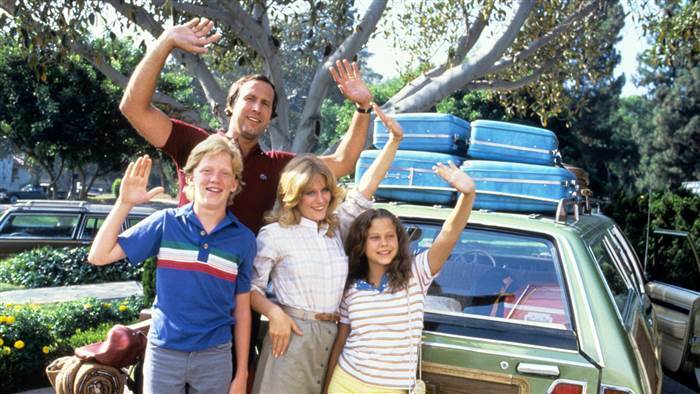 Perhaps it’s tied to what Kaleb Horton wrote about in his brilliant reassessment of the original Vacation for Vanity Fair last week: the film is a wicked, cynical send-up of Reagan-era suburbia, and perhaps “Holiday Road” is an unwitting accomplice to that viewpoint. Maybe Lindsey Buckingham saw the same nose-thumbing at the Griswolds’ idealized version of the American Dream that Vacation writer John Hughes and director Harold Ramis did, and built a dopey piece of ear candy in kind. Whatever the reason, there’s a good chance I’m going to queue up Buckingham’s gonzo earworm a few more dozen times before Labor Day, dreaming of the kind of madcap montage lifestyle often promised by jaunty comedies like National Lampoon’s Vacation. Why not take a ride with me? It’s a long way down that holiday road. Wow, I forgot how weird that video was, given the juxtaposition.